The best-known example of the interface is on Apple’s iPhone and iPod Touch devices. It allows you, for example, to rapidly flip through photos, lists of emails or song titles by merely “flicking” a fingertip on its screen, or to resize a photo by “pinching” the image with two fingers. And, this month, Apple moved some of these multitouch features onto a laptop, its new MacBook Air, where fingertip actions are performed on an oversized touchpad rather than on a screen. Apple didn’t invent the multitouch concept. Academic and commercial researchers, and small, obscure companies, have been working on it for years. Apple is adapting the concept, adding its own ideas and popularizing it — just as it did in the 1980s with the mouse and the graphical user interface, which had also been invented elsewhere. Rival companies are scrambling to add multitouch features to laptops and other digital gadgets. Synaptics, a leading supplier of touchpads for laptop makers who compete with Apple, has announced that shortly it will incorporate several multitouch features into its touchpads. Microsoft is producing a coffee-table-size computer called the Surface, meant for hotels, casinos and retail stores, that uses multitouch finger gestures to move around digital objects such as photos, play games and browse through product options. Hewlett-Packard developed a prototype of a similar multitouch coffee-table computer for home use. And, in the back rooms of this month’s Consumer Electronics Show in Las Vegas, various cellphone makers, seeking to emulate the iPhone, were showing off their own unannounced efforts at multitouch. One prominent cellphone maker, Taiwan-based HTC, has already built a phone, called the Touch, which slaps a rudimentary multitouch interface on Microsoft’s Windows Mobile operating system. The basic touch screen, of course, is an old and familiar thing. People use them every day to get money from ATMs or to check into flights at airport kiosks. Microsoft’s Tablet computers and Palm’s Treo cellphones, among others, use touch screens that employ styluses or fingers to move cursors, select icons and other items, and even to write on the screen. But multitouch interfaces are potentially much more versatile. They allow you to use your fingers to manipulate virtual objects on a screen as if they were real, sort of the way Tom Cruise’s character did in the 2002 Steven Spielberg science-fiction film, “Minority Report.” For example, Microsoft’s Surface allows users to rearrange groups of digital photos by just dragging them around on the table top as if they were actual paper prints. Unlike the touch screens on, say, ATMs, multitouch devices are able to distinguish between the press of a single finger and the press of multiple fingers, and to interpret the motions or gestures you make. They take different actions depending on how many fingers they detect and which gestures a user performs. On Apple’s MacBook Air, the touchpad still allows you to use one finger to move the cursor and click like a mouse can. But, optionally, it can do much more using multitouch gestures. 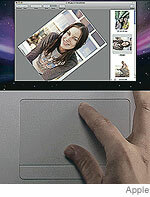 You can rotate photos by just touching two fingers to the touchpad and moving the images on the screen as you wish. You can quickly move back and forth through a series of Web pages or photos by “swiping,” or placing three fingers on the touchpad and moving them rapidly sideways. And you can shrink or expand a photo, or zoom in and out on a Web page, by pinching the image. All recent Mac laptops, not just the new Air, have the optional ability to scroll through a screen without using any button or special zone on the touchpad. You just place two fingers, instead of one, anywhere on the touchpad and drag them across its surface. In addition to pinching, the new Synaptics touchpads have a feature called “ChiralMotion,” which achieves rapid scrolling by moving two fingers in a circle anywhere on the touchpad. Another Synaptics feature, called Momentum, lets you emulate a trackball by flicking a single finger across the touchpad. This gesture can move an object on screen, like a virtual bowling ball in a game, with the illusion of inertia. It’s too early to know if the new multitouch approach will ever be as big as the mouse-driven graphical user interface. But it’s already evident that it offers real advantages on devices where a mouse isn’t possible or convenient to use, or the decades-old interface of menus and folders is too cumbersome. Email me at mossberg@wsj.com. 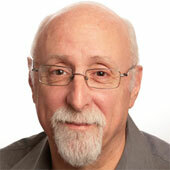 Find all my columns and videos online, free, at the new All Things Digital Web site, http://walt.allthingsd.com.